Come out and give it a try, be ready to laugh at your dog and yourself. While learning the signs, you may get hooked on Rally. Joan Reid is a judge for CKC Rally and CARO Rally. 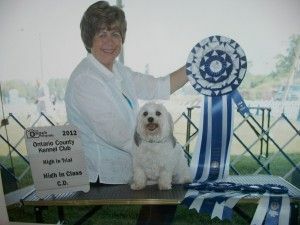 She is a member of the Canadian Kennel Club, Canadian Assc Rally Obedience, Canadian Assc of Professional Pet Dog Trainers, and the Oshawa Obedience Club. Joan is a member of the St John Ambulance Therapy Dog program, where she also acts as an evaluator (Adult and Child Testing). Joan is also an evaluator for the CKC Canine Good Neighbour Program. The Canine Good Neighbour Program identifies and rewards responsible and caring owners and their canine partners. The dogs that pass this test have proven to have good manners at home, in public places and in the presence of other dogs. It teaches owners to have a better relationship with their dogs and the dogs to have some basic training in everyday situations. The program consists of 12 tests that may occur in eveyday living, the dog must to pass all of the tests to be sucessful. The CKC has introduced this program for ALL dogs. both purebred and mixed breeds. A great program to start your dogs in basic obedience , good manners and being a respected member of the community and having a goal to work towards. On sucessful completion of the is CGN test the CKC will send you a certificate. Please feel free to ask about this program. Joan has two dogs. Spencer is a 10 year old Standard Poodle. He has many titles in Obedience and CARO and CKC Rally, and his Canine Good Neighbour and Temparment Test. He is a St John Ambulance Therapy Dog and Child Tested. For many years, Joan and Spencer visit retirement residences and special needs classes. They also have fun playing at agility. 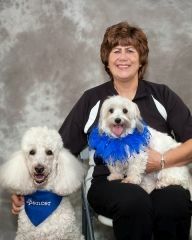 Koko is a 3 yr Havanese and has just started her career. She has attained her Canine Good Neighbour, CKC CD & Rally Excellent, CARO Rally Novice and is working on her Open level obedience. Koko also plays at agility. Taking one of Joan’s classes will show you just how much Joan enjoys working with people and their dogs, helping them learn together.